Well another month has been and gone, so it's time I posted about my May Favourites! 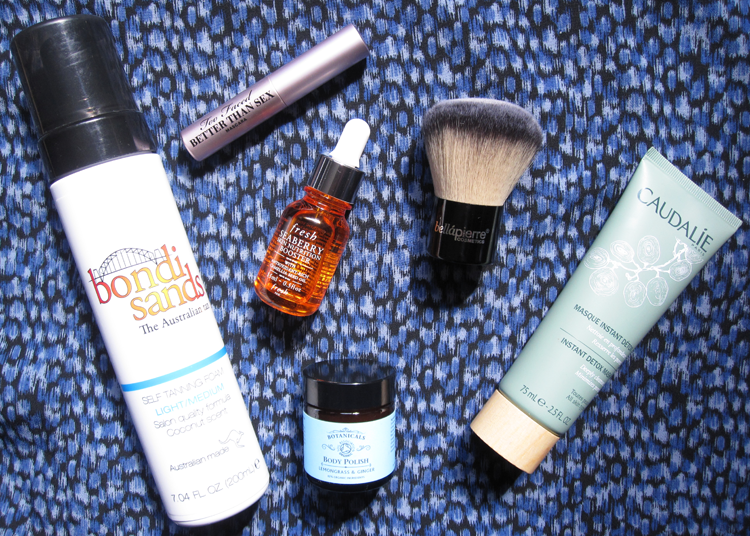 These are all products that I highly recommend as I've been loving them recently. It's the season for tanning, and if you're on the lookout for a new product to try out, I can't recommend Bondi Sands enough. I've tried out most of their different formulas (reviewed here), all of which are great, but the Foam one is definitely my favourite. Easy to apply and not a hint of orange in sight. Their stuff is amazing and affordable too - what more could you ask for?! Received this in my You Beauty Discovery Box last month and I couldn't wait to try it after reading so many hyped up reviews about it. The hype is true - this is one of the best mascaras I've tried so far this year. I described this facial oil as 'popeye's spinach for your skincare' in my review and I still stand by it. You can add this to any moisturiser, eye cream etc and it gives it an added 'oomph!' in the hydration department. A little goes a long way so a bottle will last absolutely ages. For a seriously good pamper, I'd recommend this natural body polish from Botanicals which is a sugar based scrub mixed with Shea Butter and Essential Oils. I find warming a little of this between your hands before applying it to dry skin and then popping into the shower is best, as it needs some water adding to it to help massage it in. My skin feels super soft afterwards! This was from the sold out Kiss and Makeup Box from Naturisimo and I've been using a lot with my mineral foundation to get a flawless looking finish. The bristles are incredibly soft so it feels lovely when you're buffing the product in. I'm always impressed with Caudalie products so I couldn't wait to try their new face masks when they launched recently. The Instant Detox Mask is fantastic for anyone who has skin which is prone to breakouts and blemishes as it draws everything out and gives it a really deep clean. Reviewed in full here.